Join Illinois Audubon in far southeastern Illinois for a full day and evening of exploration, adventure and learning. Dr. Michael Wiant, Illinois antiquities expert, will guide us back in time as we explore two prehistoric settlements: Kincaid Mounds, the site of one of the largest settlements of the Mississippian culture, and Millstone Bluff, the site of a Late Woodland “stone fort”and Mississippian village situated atop a bluff that rises 320 feet above the surrounding terrain. 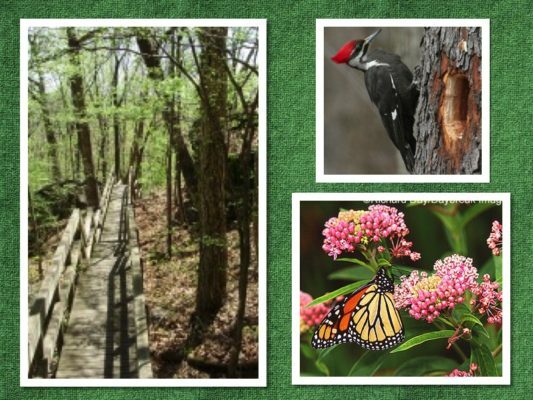 We’ll then head over to the IAS’s 500-acre War Bluff Valley Sanctuary near Golconda where we will attend the 24th Annual Insect Awareness and Appreciation Day hosted by the Shawnee Chapter of IAS. This extraordinary event features a variety of short, entertaining, expert-led workshops, a Really Cool Raffle, dinner, and after-dinner entertainment by RognboB. Time will be built in to all locations for a little birding, as well. Trip cost includes van transportation to and from meet-up location in Marion, Illinois, lunch, dinner, snacks and water. More details including lodging suggestions and the exact meeting location in Marion will be sent along with registration confirmation.